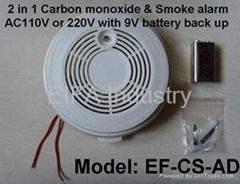 Ningbo EIFA Industry Co., Ltd. has been a leading and professional manufacturer and supplier of electronic novelties for several years, specialized in gas leakage detectors/alarms and carbon monoxide detectors and smoke alarm and emergency mobile phone chargers . Our mission is to deliver high quality products in time and good services at competitive prices. We supply gas leakage detector/alarm, carbon monoxide detectors, smoke alarm, rechargeable battery pack, solar battery charger, solar mobile phone charger, wind-up charger, hand rotary charger with flashlight, AA battery charger, battery charger, emergency charger, multifunctional charger … etc. We also provide an OEM/ODM design and manufacturing service to meet buyers' customized requirements. Owing to our high quality products and superb services, we have been well accepted by a lot of business partners all over the world. We are looking forward to cooperating with your company, and appreciate inquiries and correspondences from interested parties.